When CannonDesign first met with UnityPoint Health-Trinity’s leadership to begin the design and planning process for their new ED and Heart Center in early 2012, it was one of the first opportunities the firm had to deploy its trademarked outcomes-based visioning methodology as part of an integrated, interdisciplinary process – pairing Health Advisory Services with Architecture and Interior Design services. 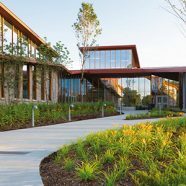 Upon its opening three years later, the new facility is being recognized by both UnityPoint Health-Trinity’s leadership and the press for the use of this process in the final design and the positive impact it will have on the community for years to come. Opened to patients in April, the new ED and Heart Center on the Rock Island, IL campus is a new three-story expansion that will help Unity Point Health-Trinity consolidate their cardiac services and expand emergency services at their Rock Island campus. 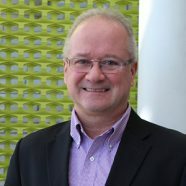 Engagement with an interdisciplinary team of clinical providers from both UnityPoint Health-Trinity and CannonDesign early in the design process provided the opportunity to thoroughly explore how innovations in the model of care and corresponding changes to patient flows, processes, staffing and use of clinical and information technologies will evolve in the future. 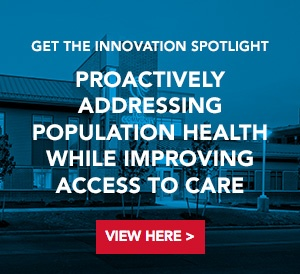 This supported the development of a solution that exemplifies many best practices in both clinical care and healthcare design. 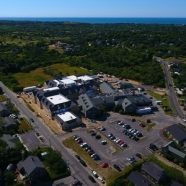 The success of this project is a testament to a great, forward-thinking client at UnityPoint Health-Trinity, the benefits of integrating operational and facility design processes, and the incredible talent and heroic efforts of the project team to always address this client’s challenges. – Deborah Sheehan, Executive Director of CannonDesign’s Health Practice. The Heart Center supports UnityPoint Health-Trinity’s goal of creating of hub for cardiovascular diagnostic and therapeutic services for the area. These services are right-sized to accommodate the current and future needs of the service population, especially seniors. Improved access and adequate capacity make these services more available to the community. The new Heart Center will help UnityPoint Health-Trinity improve access and coordination of care to improve the health care and well-being of the market area population. 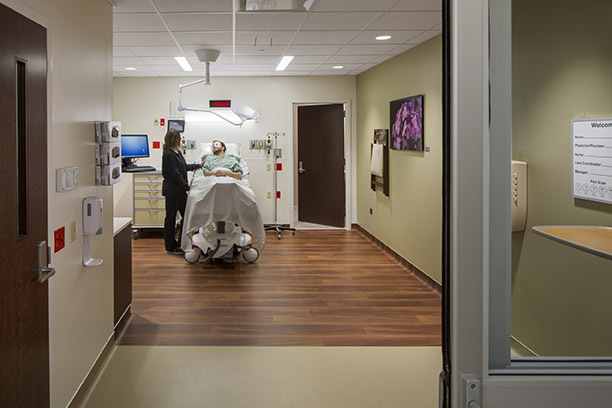 The Emergency Department includes distinct areas that help improve patient flow through and around the main ED, including a care initiation area, front of house imaging, and an observation unit. Medically stable behavioral health patients can receive their medical screening in the crisis stabilization unit which is directly adjacent to the ED. This allows for more rapid disposition of behavioral health patients, in an environment free of the ED milieu that can trigger behavioral escalation. Within the crisis stabilization unit, a patient lounge known as the “living room” provides a relaxing and non-institutional environment for medically stable behavioral health patients not requiring de-escalation or administration of psychotropic medications. For additional information and imagery of the new space, see the UnityPoint Heath-Trinity Heart and Emergency Department profile.